We visited Godminster to find out more about what goes into making their award-winning brie and cheddar for our Riverford boxes. Richard Hollingbery, owner of Godminster Farm in Bruton, Somerset, has a simple mantra – nature repays those who treat her kindly. They are one of a dwindling number of dairy farms that are also cheesemakers, and we think this direct connection makes their cheeses all the better. Farm manager Pete Cheek and Richard have crossed their 230 head herd of British Friesians with Swedish Red, Norwegian Red and Hereford breeds, to produce animals that are well-suited to the largely pasture based organic system of dairy farming. This also means that male calves can be brought on as beef animals. Wildlife is encouraged all over the farm with wide field margins and carefully managed ponds and hedgerows, while homeopathy is used as part of the herd management. On the cheesemaking side of the business, Richard has perfected the recipe for Godminster cheddar over the last 10 years, creating an unusually creamy cheese. Brothers Steve and Malcolm Dyer, along with Ashley Reynold, are Godminster’s treasured brie. They work closely with Pete, the farm manager, so that they can tweak their cheese making process as the cows’ diet changes through the year; a wet summer for example will produce different milk to a hot one. All of this impacts how the cheese is made, as everything from temperature to pH and fat levels can influence how it turns out, and it takes an expert eye to know how to manage it. The brie is made in small batches and the curds cut by hand, with the team using a traditional liquid brine along with herbs, garlic and black pepper to infuse different flavours into the cheese. The result is a fantastic, authentic brie range that is full of character. Definitely one of our favourites! Separating curds & whey, ready to pack into cheese mould. The cheese is made a stone’s throw from where the cows roam, grazing on organic grass and clover. Their milk is pasteurised before having rennet added to it and kept at 23C for a day and a night. 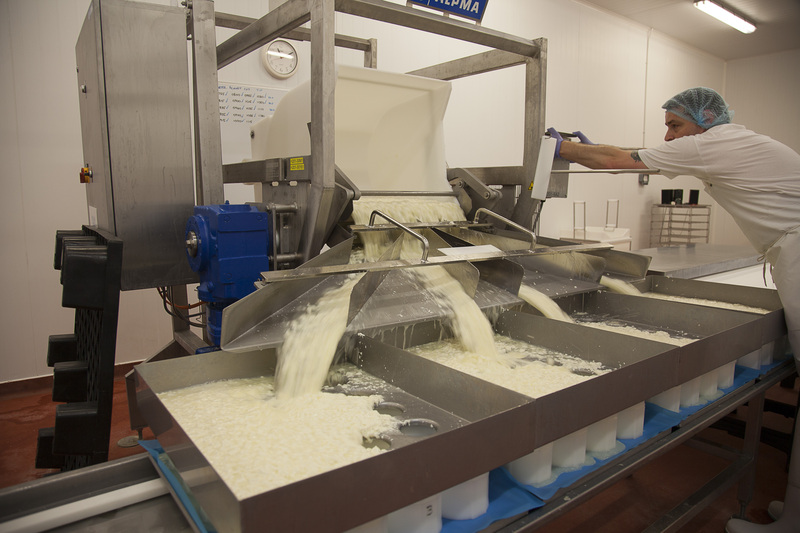 When ready, the curd is cut by hand using a ‘harp,’ tipped into plastic moulds and flattened by hand. The whey is drained away. The brie goes into a brining room for 24 hours, then a ripening room for 5 days – this is where the bloom (or what we’d call the skin) starts to form. The team at Godminster make 80 cheeses at a time, which are cut and turned before being hand-wrapped and ready for our boxes.